Imagine if Congress passed a bill that the president signed that allowed indefinite detention without charge or trial. That would be issue one at any presidential debate, wouldn’t it? The media’s favorite debate moderator, Martha Raddatz, would have forced a full discussion of that one at the vice presidential debate, wouldn’t she? Well, Congress did pass that law last year and President Obama signed it and he never mentioned it on his list of his accomplishments in any of the debates. And he was never asked about it, not by the media’s second favorite debate moderator, Candy Crowley, and not by Mitt Romney. It never came up at the two-party presidential debates. 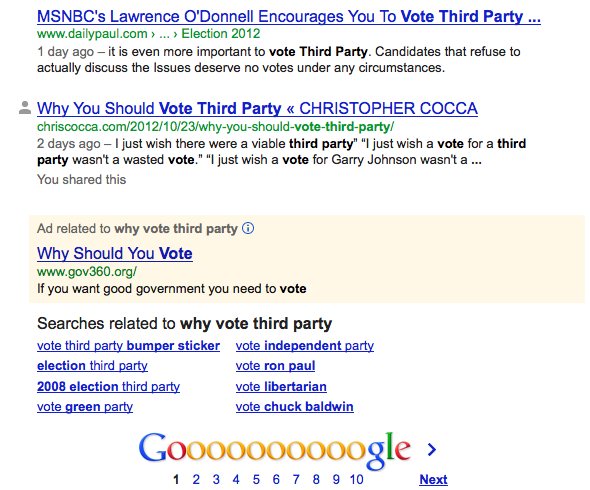 O’Donnell encouraged people to vote for third party candidates, especially in swing states.